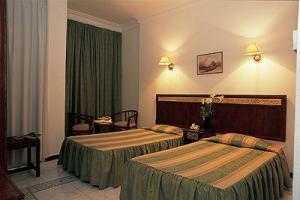 Cairo center hotel is a new boutique hotel, located downtown cairo, in 1921 french style building. in front of the jewish temple, sharia Adly is one of the most important streets which never sleeps, providing the most incredible selection of shops for shoes, bags and fashion clothes. Just 5 minutes walke from the egyptian museum and 5 minutes by local taxi to Khan el Khalily and old islamic city. with the metro you will reach quickly the main touristic areas as coptic churches and museum (Mari girgis station). The Majority of rooms have twin bed arrangement. Rooms with King size bed and connected rooms are also available. Stand Lamp and Night Lamp. Twin terrace/ balcony chairs and table.